Our 2017 Road Trip, Part 32: Broad Stripes and Bright Stars II « Midlife Crisis Crossover! Our lead photo is the visitors’ center with adjacent exhibit space, added next door in 1952. 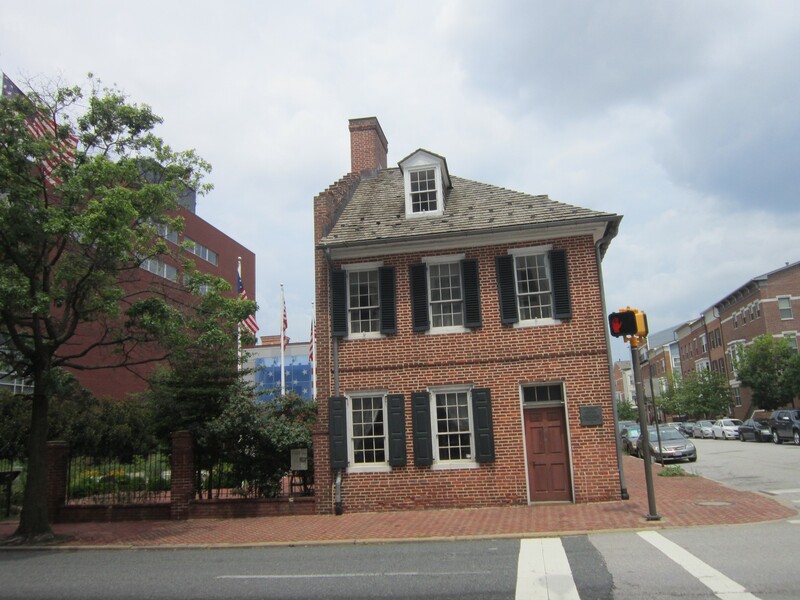 The “Flag House” itself is a bit more modest and weathered. Holding up well considering it was built in 1793. 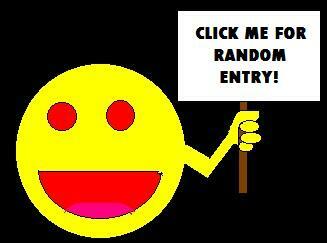 The TL;DR version of this entire entry. 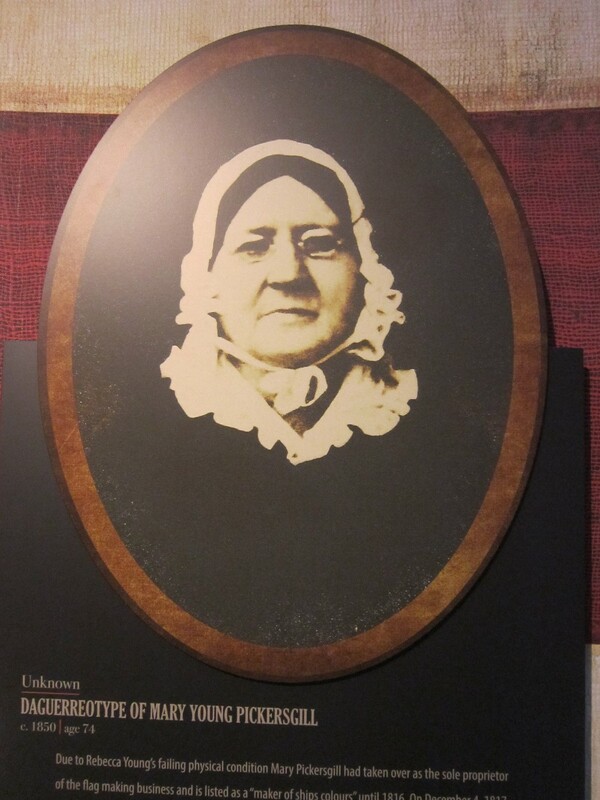 Mary Young Pickersgill was a seamstress who moved into the house in 1806. 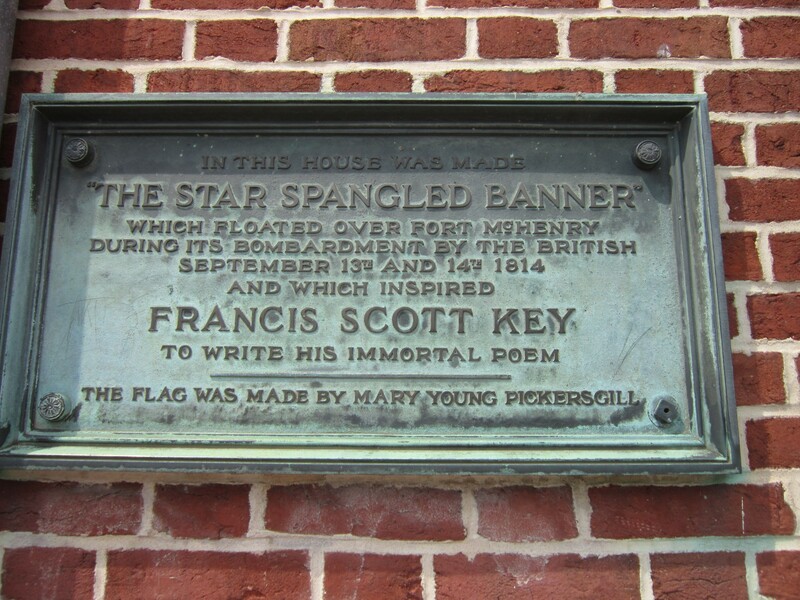 Unable to wrangle all 1,260 square feet of the Star-Spangled Banner herself, she had help from two nieces along with a young black woman who was either a “free apprentice” or an “indentured servant” depending on which Wikipedia entry you believe. It weighed fifty pounds, flew from a 90-foot flagpole, and earned her and her team the princely sum of $405.90, which in 2017 figures would be roughly eleven billion dollars, I think. 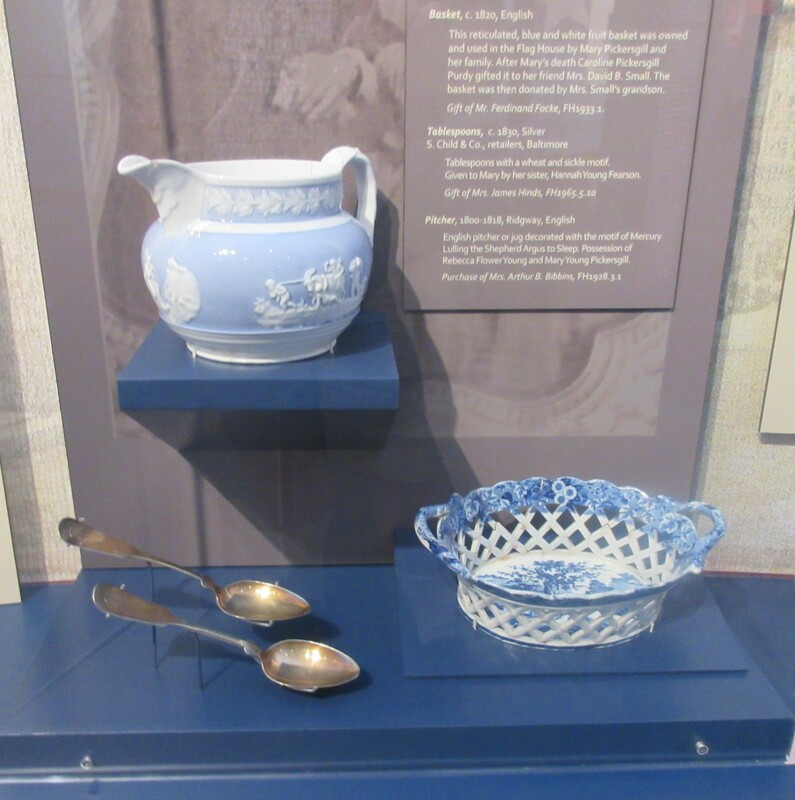 Visitors have the option of touring Ms. Pickersgill’s place, which still contains some of her original possessions, but also contains a few replicas like her possessions. This is an important distinction for Anne, who favors authenticity and is more than happy to see historical “replicas” just by Googling stuff for free at home. 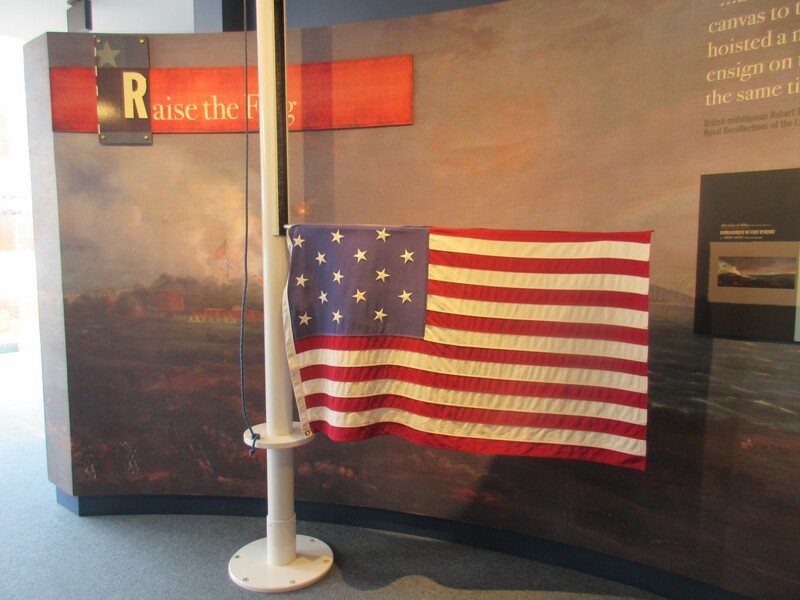 We arrived early enough in the day that the docent at the front desk let us borrow a tour guide binder so we could walk around the Flag House at our own pace but still learn some context. Unfortunately we were a bit too slow and wound up having to share the cramped two-story dwelling with a large senior citizen tour group. We joined them for a few speeches, but mostly dodged around them the best we could without being too distracting (we hope). 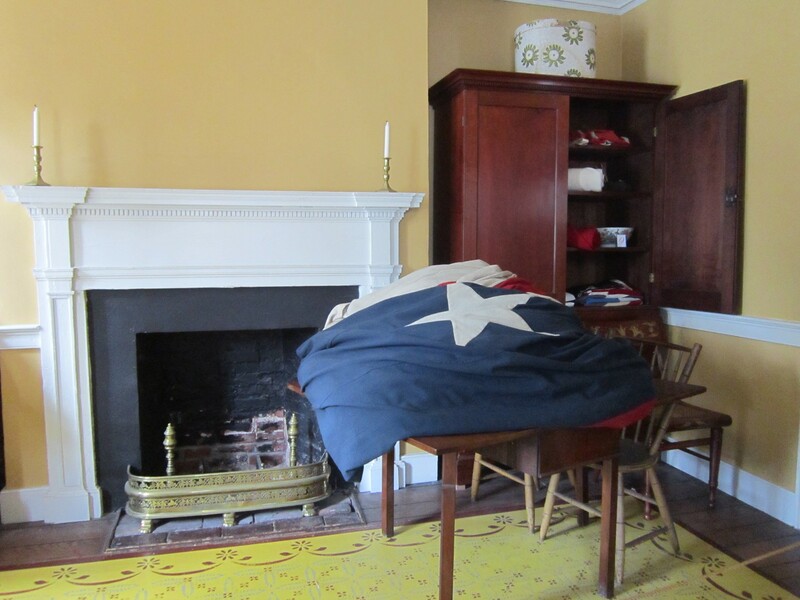 Giant folded flag in repose. 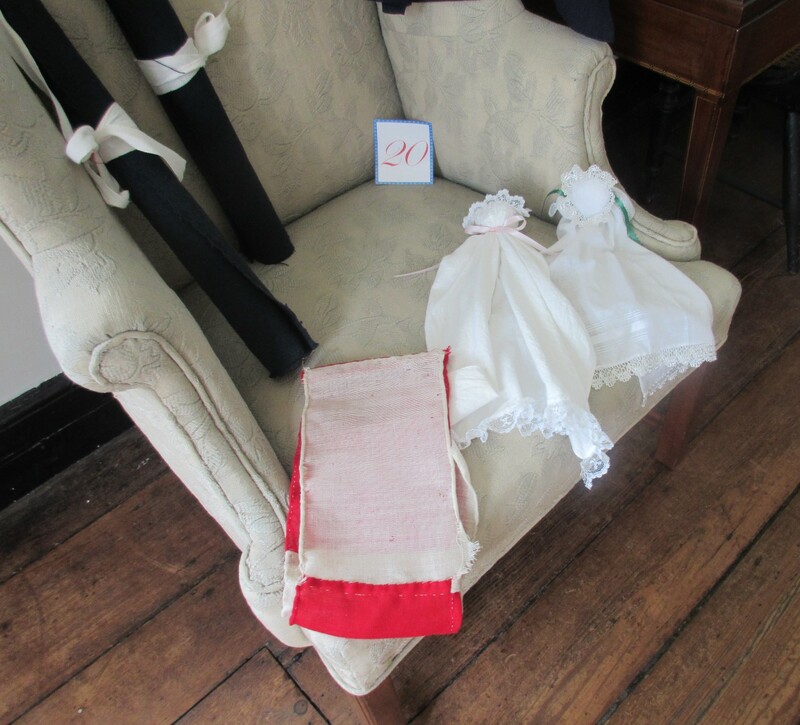 Other sewing projects in progress included a pair of cloth dollies, the perfect gift for a girl born 260+ years before you could buy her action figures for Christmas. 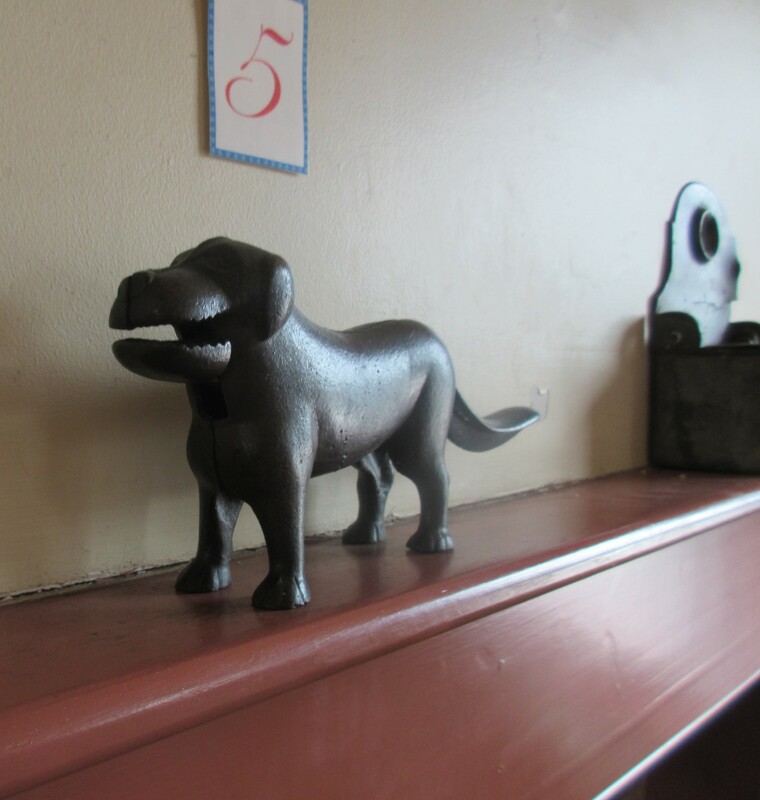 Authentic 18th-century doggie toy, I think. We weren’t allowed to keep the binder, so I can’t verify this just now. 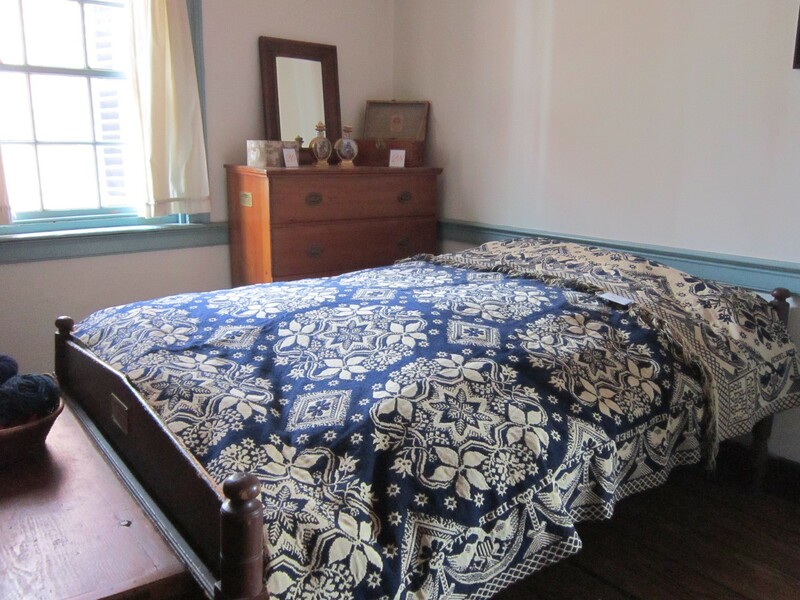 Full disclosure: some historical homes can be dull to tour if they’re just a series of ordinary rooms with ordinary furniture whose only peculiarity is their oldness. For those who love random bedroom suites more than we do, here one is. 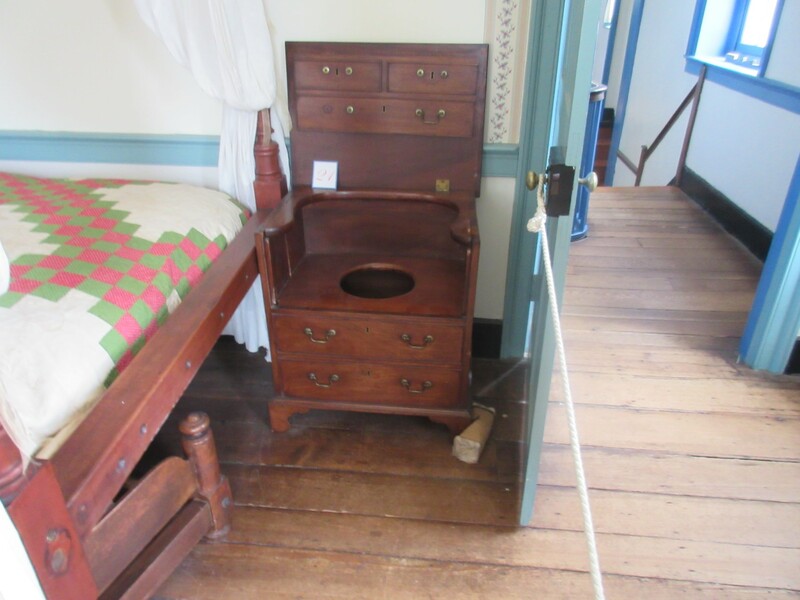 And for those who love antique bedside bathroom facilities, here one is. 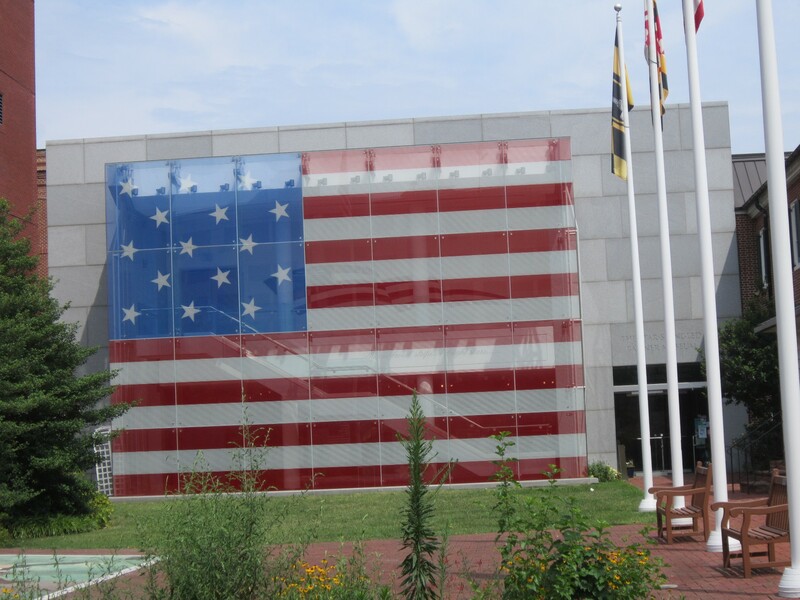 The Visitors Center is a newer, shinier facility with exhibits that place Pickersgill and our flag in the greater context of the War of 1812, and educate all-ages audiences on the flag in general. There’s also a modest gift shop, but no smashed penny machine. 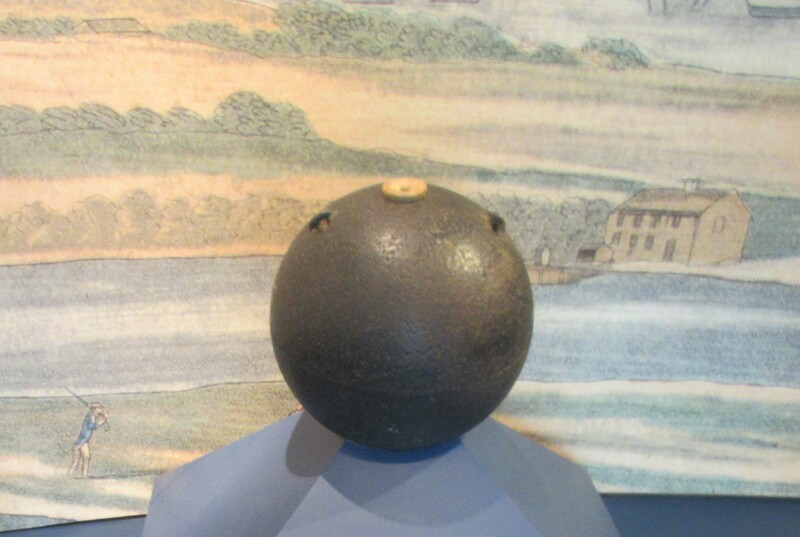 One of the thousands of 186-pound mortar bombs that pelted Fort McHenry over the course of Sir Key’s stay. 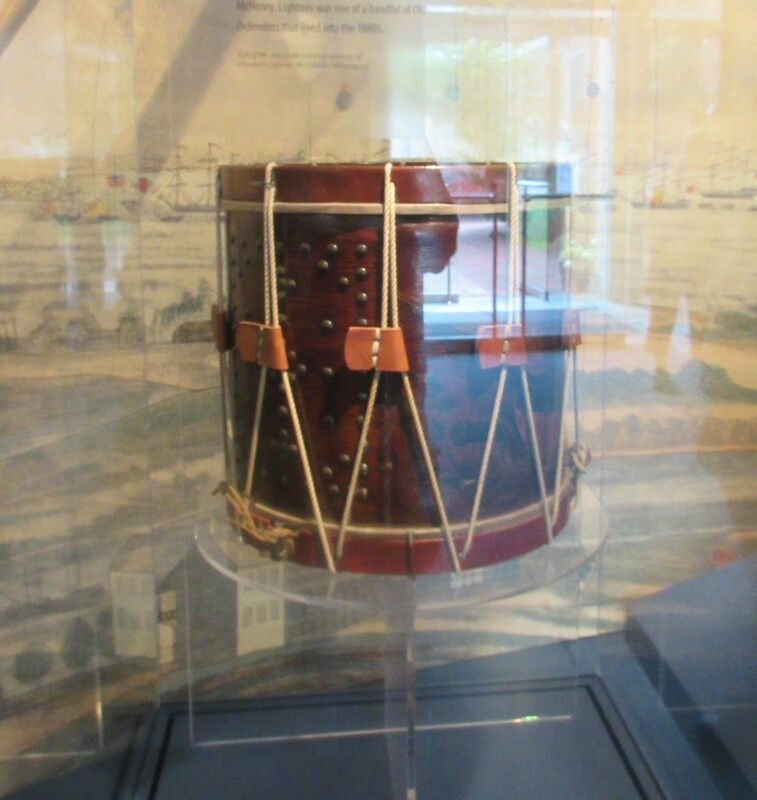 Actual snare drum played alongside our 19th-century troops, back in the days when bands were willing and ready to play live on battlefields. 200 years later, Green Day would refuse to return Blackwater’s calls. What’s left of Ms. Pickersgill’s own table service. No, you can’t borrow it. 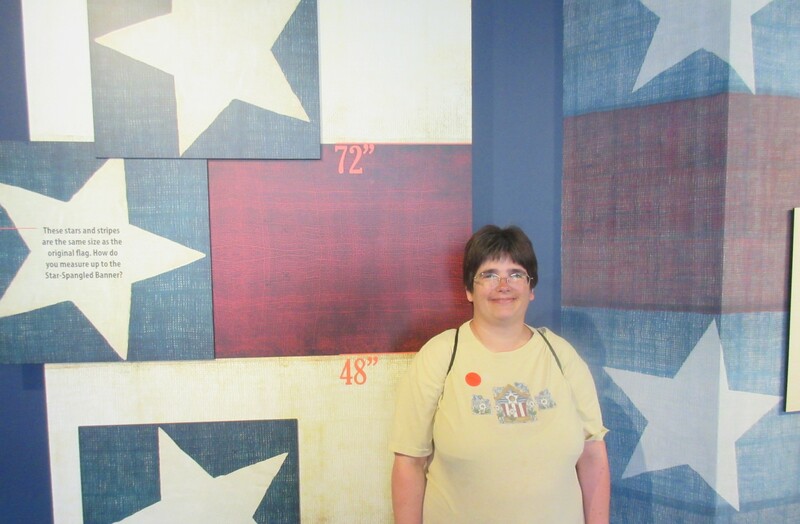 How do you measure up to the actual-size stars and stripes? Dare we even try to measure up? Now you too can try your hand at raising the flag, rallying the troops, and being the beacon of freedom and liberty for everyone around you. No pressure.